...to Bill Lomas Motorcycles. We have more than 50 years experience in supplying quality motorcycles. If you are looking for great savings on quality used bikes in the Chesterfield area, then you have reached the right place. Bill Lomas Motorcycles Ltd are a specialist used bike dealer based in Derbyshire. 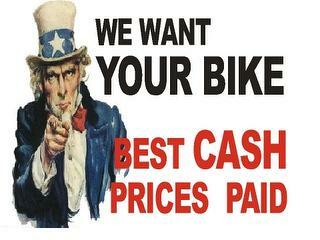 We are proud to offer you a first class customer service and very competitive pricing, so please Our Used Bikes. At Bill Lomas Motorcycles Ltd, we stock a range of used bikes to suit all budgets and lifestyles so we are sure to have the right bike for you. Bill Lomas Motorcycles was first established in the 1930’s by Harry Lomas, and the name changed to Bill Lomas Motorcycles in 1955 in honour of the second World Championship win in the 350cc Class by Bill (Harry’s son)…it has been on the Clay Cross site now for over 50 years and must rate as one of the longest established motorcycle dealerships in the UK. The company is still family owned and is owned and managed by Tim Lomas. Having been in the Motorcycle industry for three generations the company is well placed to source quality new and used vehicles at more than competitive prices. The Clay Cross based firm has full workshop facilities, and employ’s factory trained mechanics. Also it is a MOT station and has a tyre fitting bay. We specialise in late model used machines which are prepared to a very high standard, Not the largest dealership by any means our compact size enables us to operate with low overheads and sell some fantastic bikes at low prices to the discerning buyer, but backed up with full dealer facilities all our bikes are HPI checked, carry a full 12 month MOT and are PDI serviced before sale. With our many long established contacts throughout the trade we can source many difficult to find bike both new and used, In the past we have been Main Dealers for all the major makers and can boast of being one of the earliest Honda dealers in England. We realise that buying a bike can be a daunting experience, but don’t worry, we are well established within the Chesterfield area and come with a great reputation. Furthermore we offer excellent advice and experience on vehicles and vehicle maintenance. Our friendly staff will go the extra mile to guarantee that you receive the advice you need. This is the reason why many of our customers keep coming back to us. At Bill Lomas Motorcycles Ltd we don’t just sell bikes, we do everything possible to get you driving your perfect bike. Why not come along to our dealership in Chesterfield? We look forward to meeting you!